The Ford Ranger pick-up platform underpins the all-new Ford Endeavour 2016. This is a ladder -on-frame construction and has its inherent strengths of durability and ruggedness. It doesn’t have a jazzy styling but looks premium. The Ford Endeavour 2016 reminds you of the classic American muscle trucks. It comes with a new trapezoidal front grille which has horizontal slats. Then there are projector headlamps with LED DRLs, a roof-mounted rear spoiler and 18-inch alloy wheels. An Endeavour branded chrome strip runs across the tailgate between the tail lamp clusters. This makes it look premium. The Ford Endeavour 2016 is rugged and sleek. This SUV is 4892mm long and has a ground clearance of 225mm. 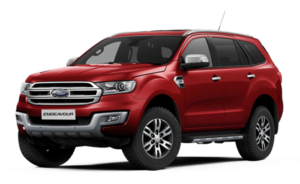 This allows the Ford Endeavour 2016 to tackle any kind of terrain with ease. The menacing road presence and massive size can make the weak tremble. This makes the Ford Endeavour 2016 stand out in a crowd. Step inside and you’ll be happy to note that the vast exterior dimensions have liberated good interior room, and with it has also come a much plusher feel. The dashboard top is covered in double-stitched leather and feels nice to touch, although lower down in the cabin, you’ll find some bits that seem low-rent for the price. The Titanium variants get a nice 8-inch touchscreen with Ford’s latest infotainment system, called Sync 2. In addition to providing Bluetooth connectivity and streaming music, it also uniquely allows for voice commands, and a valet mode that can shut off the display when you are handing over the car to someone else, protecting any personal data you might have stored in the system. The touchscreen system is flanked by two large air-con vents and on top of the glovebox is a nice, chunky, satin-finished plastic strip. The steering wheel feels great to hold and is well designed, but has a few too many buttons on it. There are two hi-res information screens in the instrument panel that sit on either side of a central speedometer. The one on the right is the car-and-driver interface, while the one on the left is a display for the audio functions. The centre console looks nice and simple, with not too many buttons except the AC and audio controls. Below this there are multiple power sockets followed by a nice cavity to store odds and ends. Just ahead of the gearknob, there are buttons to control the park assist, traction control system and a dial for the off-road controls. This rotary dial operates Ford’s Terrain Management system. There’s space behind the gearlever with two rubberised cup holders and all the doors get bottle holders too. Sink into the large, powered driving seat and finding a good driving position is quite easy. You immediately realise the new car is much wider on the inside than the earlier one and there’s an abundance of legroom in the second row too – the seats, though a touch too low, are quite comfortable with good cushioning. Headroom is not too great on variants equipped with the panoramic sunroof though. The third row, however, isn’t quite spacious enough for adults – you are sat low, it’s cramped for kneeroom and headroom, and access is quite a chore. The ability to slide the second row forward does at least afford some relief, making it possible to use the last row occasionally over short distances. Impressively, the third row is powered, and can be folded away at the touch of a button, but even with them in place, luggage room is not too bad. Fold them away though, and space is properly impressive. Unlike the previous Endeavour, the boot opens via a hatch, not a door, and it’s powered. This also means the spare wheel has had to be moved to beneath the car. The model we test drove was the 3.2L TDCi with a 6-speed automatic gearbox. On paper, the engine might seem a bit less powerful than may be required for a behemoth like the Endeavour. But with more than adequate torque available through the rev-band, the new model doesn’t seem weak or lumbering on the road. There is a healthy 470Nm of torque available, though this peak level is generated within a small rpm-range of between 1,750 to 2,000 rpm. As a result, the 3.2L TDCi has a punchy and strong mid-range, and the sub-1,500 rpm acceleration cycle feeling a bit more laboured. Idling rpm-level is at about 900 rpm. Its performance on the road is brisk and the torque converter gearbox is often what seems to be the part of the powertrain that needs to better match the engine. The new Endeavour has excellent stopping power despite the fact that it is shod with MRF Wanderer All-Terrain tyres. The other engine on offer is the 2.2L TDCi, which puts out a peak power of 160PS and peak torque of 385Nm. This variant is also offered with the option of a 6-speed manual gearbox. Both the engine models are offered with 4X4 variants. With an electric locking rear differential and an All Terrain Management System, the new Endeavour’s 4X4 capability is quite significant. Capable of shifting on-the-fly with the rotary selector and with a water-wading capability of 800mm, the Endeavour is built to get off the road on an expedition or maybe even stay on it during the monsoons! Ford Endeavour 2.2l 4×2 At Trend Ex-showroom Price is 25,61,099/- and On Road Price is 31,98,564/- in Bangalore. Ford Endeavour 2.2l 4×2 At Trend comes in 6 colours, namely Diamond White,Golden Bronze,Moondust Silver,Panther Black,Smoke Grey,Sunset Red.